Delicate repetition and astonishing detail help to create this silvered meditation on the nature of beauty. The word "filigree" derives from the Latin words filum (thread) and granum (seed). 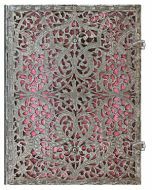 The filigree bindings are enhanced with foliage-ornaments and clasps. The original binding of our Shadow, Natural, Blush Pink and Maya Blue covers was created in Strasbourg, France in 1697 to house Paradiesgärtlein, a text by Johann Arndt (1555-1621). To achieve the gilded and polished motif, a base layer of silver sheets was first die cut, and elaborate grooves were then meticulously etched into its surface. The same technique was applied in Germany in the early 1800s to create the design adorning our new Aubergine and Esmeralda covers. 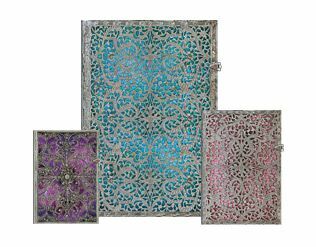 Paperblanks Silver Filigree Aubergine Ultra LINED.